Hi there! Because of how the weeks fall in April/May, I will starting the April plans next week, April 6th. This week I will do a little bit more of review, plus some fun Easter egg activities! Directions: Glue popsicle sticks down onto a piece of paper into the shape of a pentagon. Remind your kiddo that a pentagon has 5 sides as you count them together. Invite them to decorate each side of the pentagon differently. Have different craft supplies ready for them to glue down items. (Buttons, stickers, crayons, noodles, beans, beads, etc) This is a simple way to reinforce a lesson about shapes, and to keep those little brains and hands working! Directions: This month we celebrated Dr. Seuss's Birthday, plus we learning about the color green. I knew we had to do this activity. I was initially going to dye rice green, but I'm feeling especially unenthusiastic about effort this week. Amen? Instead I bought some bags of dried split peas and they did the job perfectly! I made a sensory bin out of some play cooking utensils, Easter eggs, paper with green eggs drawn on it, and a few other items from the book. (Train, car, box, goat, boat, tree, etc). I read the girls the book "Green Eggs and Ham" by Dr. Suess, then invited them to play and act out the story with the sensory tray! It was so fun! (The audio book of this story is read by Jason Alexander, George from Seinfeld, so it was fun for them to listen along while they played!) Immediately, one kiddo of mine filled up an egg with the peas and said, "I made a maraca!" I was so proud! Directions: Lay out an egg crate or muffin tin filled with various colors of opened plastic Easter eggs. Encourage your child to color match a corresponding pom pom with the egg. To make this more of a challenge, (and keep them busier for a longer period of time!) invite them to use kitchen tongs/chopsticks to place the pom poms into the corresponding egg. Have fun! Directions: Separate the top and bottom of plastic Easter eggs (cut the little connecter apart if need be.) Then, dip the egg into coordinating colored paint and use it as a stamp on the paper. This art is so simple and fun for all ages! Directions: Draw an egg shape on a piece of paper. Clip a large pom pom onto a clothespin to act as a paint brush. Invite the child to paint fun dots all over their egg! (I saw this on pinterest and thought that my kids would open the clothespins and be wild, but they didn't! Hooray!) They dipped and painted and had a grand time! This activity is great for reinforcing color matching as well as encouraging creativity! 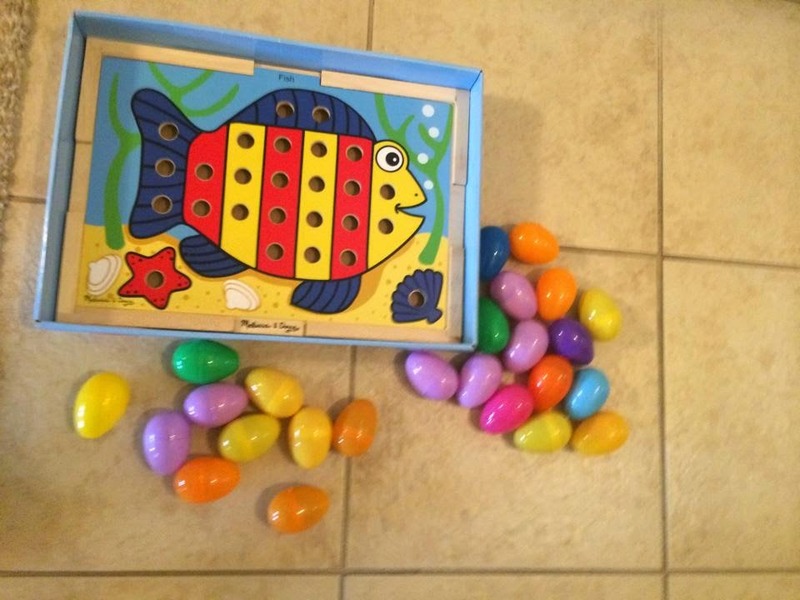 Directions: Hide pieces to a puzzle/game in Easter eggs. Then, hide the eggs around the house and have the child search for them! 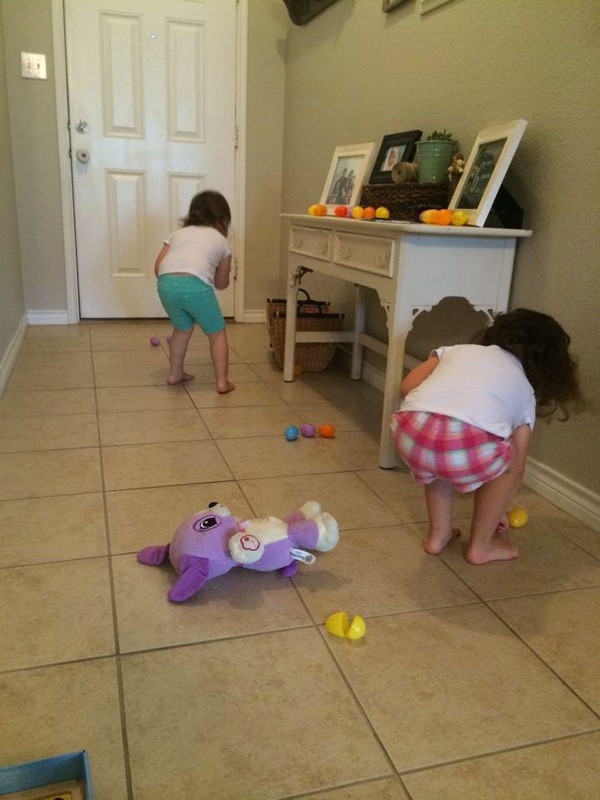 They love running around gathering eggs, and completing a puzzle is a fun way to make sure that they have gotten all of the eggs! 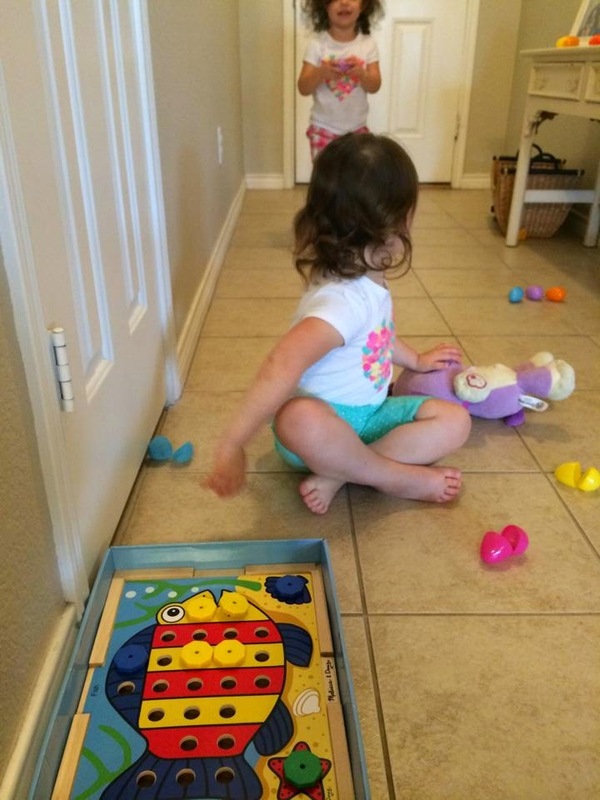 We used this toy, but you can use any puzzle! That's all friends! Next week will begin new themes!